This morning when I woke up it was 5 degrees in the Midwest. So like all crazy mid-westerners I thought today would be a great day to start planning our garden. We moved last summer, so this year we will start from scratch at our new home. As we are planning the new garden space, the very first thing we need to do is call about where all of the underground cables are on the property. Anytime you are starting a new garden space, this needs to happen so you don’t accidently hit a utility line. You can call 811 from anywhere in the United States to get this information. Once this is done, we will plot out where the garden will be. We will have two distinct garden plots. The first plot will be our vegetable garden. For this plot, we will have an “early” garden. The early garden will consist of lettuce, radishes and onions. We sow the lettuce and radishes directly in the ground. We will buy the onion sets. These are great early vegetables as they prefer the cool nights we have in the spring. I found this great chart online with a calendar for planting in your particular area http://www.burpee.com/gygg/growingCalendarNoZipCode.jsp. Soon, we will also start some seedlings inside for transplanting later in the Spring when they will be ready. We did this last year for the first time and had some success. I am planning on starting some herbs (basil and cilantro), peppers, broccoli and cauliflower. We did not have great luck with tomatoes so we will likely go to the local greenhouse and buy the plants. The second garden area will be my herb garden. This will be our fourth year for an herb garden and I finally have the basics. I am starting to do more on a personal level with herbs and natural remedies, so I will expand. In the meantime, I know we will at a minimum have basil, cilantro (lots of cilantro), rosemary, and oregano. I have begun researching other herbs that have historically grown well in our area and will expand. 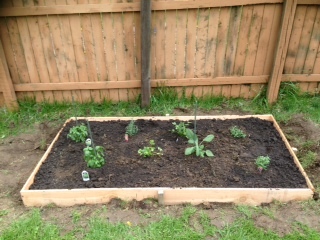 At our previous home, I did the herb garden as a raised bed and thrived. The picture at the top of the post was my very first herb garden right after it was planted. I will probably do the same thing here. We will also need to figure out some squirrel deterrent as there are tons of squirrels in our new neighborhood. As the days grow longer, I know there won’t be too much more brutal weather like we are having now. I am looking forward to the warm sunshine and getting my hands in the dirt again and seeing my garden grow. 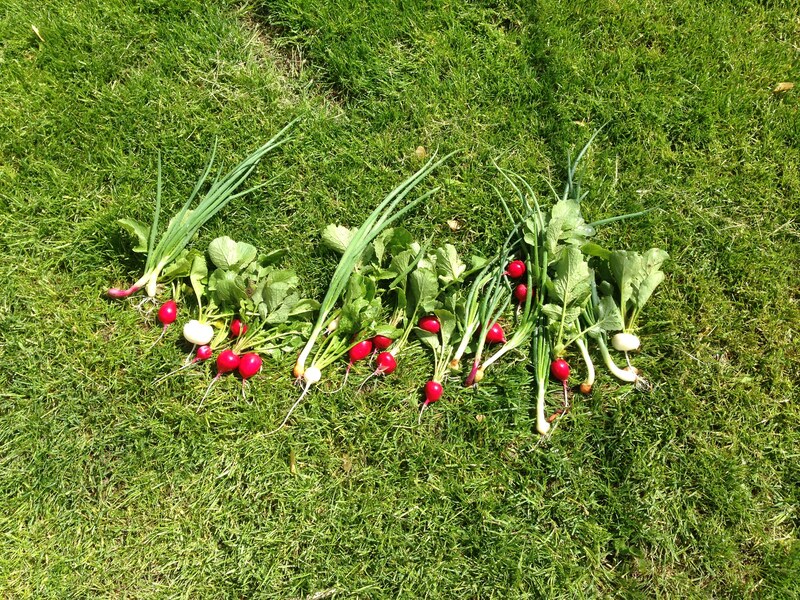 It finally stopped raining here long enough for us to get into the garden and start reaping some of our bounty. The radishes look so yummy. We are planning on having them and the fresh onions later today as a snack. I also love them in a nice lettuce salad. Although our planted lettuce is not quite ready, but with the warm weather we are supposed to have later this week I expect we will have lettuce by the weekend. We are also going to cut some fresh cilantro shortly and make up a little salsa. Although we are lucky and have a nice patch for our garden, you really don’t need a lot of space. We have a lot of our garden planted, as most of the danger of frost is past (although last night it was close). We are going to plant a few more tomatoes, peppers and broccoli today. If you would like to give a try at container gardening, I am including a link to a great website I found for urban gardening: http://www.urbanfarmonline.com/urban-gardening/random-acts-of-gardening/7-container-gardening-tips.aspx. Get out enjoy the sunshine and this beautiful Spring day we have today. Summer is just around the corner. The first day of Spring brings to mind many ways to save money and have lots of fun at the same time. It is also the beginning of working in the yard and creating the garden. One great way to save money is to plant your vegetables and flowers from seed. At first this can seem overwhelming; however, it really is easy. Because it is so cost effective, even if you do make a mistake your investment of actual dollars is not much. One way to save money on the planting is to recycle old pots and think of creative uses for other materials. Also, this time of year, you can find great sales at many of the home improvement stores. You should also be able to find sales on seeds and soil. This year, we are starting tomatoes, green peppers, cucumbers, zucchini, herbs and flowers inside. There are many other seeds you can sow directly in the earth. As soon as we get a few warm days and the ground has thawed enough to run the tiller, we will be planting our early garden outside. We plant onions, lettuce and radishes near the end of March or early April, depending on how much the ground has warmed. This year has been particularly bitter cold in the mid-west and it looks like we are going to get a late start to Spring. Last year was my first real year wanting to garden. I found it is fun and has a great deal of satisfaction. Nothing tastes better than a tomato from your own garden.